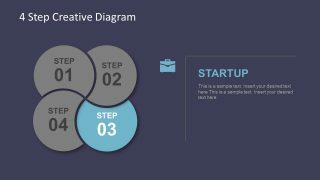 The 4 Step Creative Diagram Template for PowerPoint is a flat design, vector presentation of process flow cycle. The diagram contains flat shapes which gives the idea of overlapping circular units. 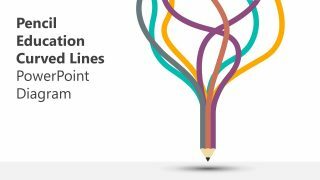 The infographic icons, clipart and other objects are design in PowerPoint shapes. Therefore, it is easier to customize all the elements of presentation. 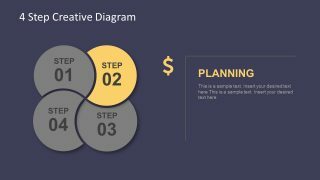 This 4 step creative process flow diagram PowerPoint has editing options like recoloring the graphics including backgrounds. Additionally, modify the infographics and shapes such as segments of diagram by resizing or repositioning. These customizations can help present the different ideas for sequence of stages, tasks and circular process cycle. 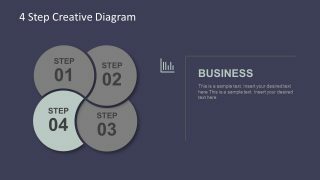 Further, the template is useful to graphically illustrate ideas and concept with 4 component or segments. 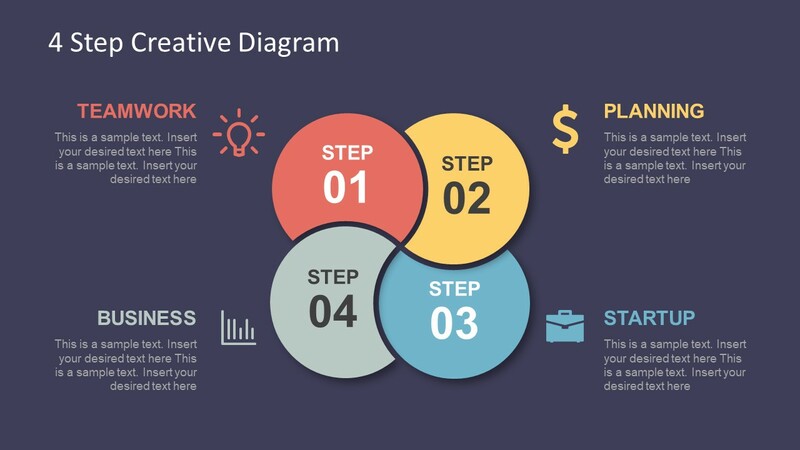 This editable 4 Step Creative Diagram Template for PowerPoint is a 5-slide diagram. Here, this first (main slide) appears as an overview of 4 segment concept. 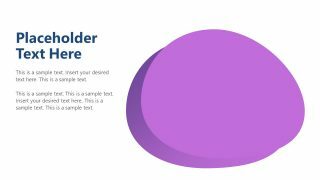 Whereas, the subsequent template slides highlight single segment of diagram with the creative text placeholders design. This is a perfect way to show a cycle of stages, process or procedures connecting step one to another. The color theme used in this PowerPoint template makes it visually interactive to the audience. For example, pascal background and colorful clipart icons to represent each step of diagram. 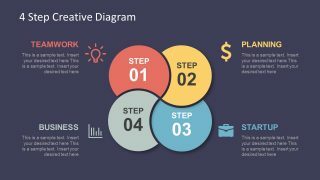 The creative template of 4 step PowerPoint diagram has business relevant infographic which represent the components of each step. These include, lightbulb for planning, dollar symbol for investment, briefcase for implementation and bar chart for analysis. This 4 step diagram can assist the users to make various project presentation comprising of similar processes. The professional design of template lets the users from several industries to make brilliant presentations. For instance, medical, academic, management, technology, finance and other streams. 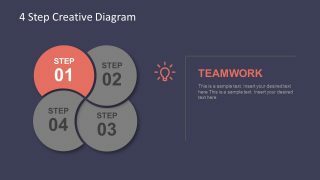 There are more amazing 4 step PowerPoint diagrams like Hexagonal Infographics of 3D shapes.